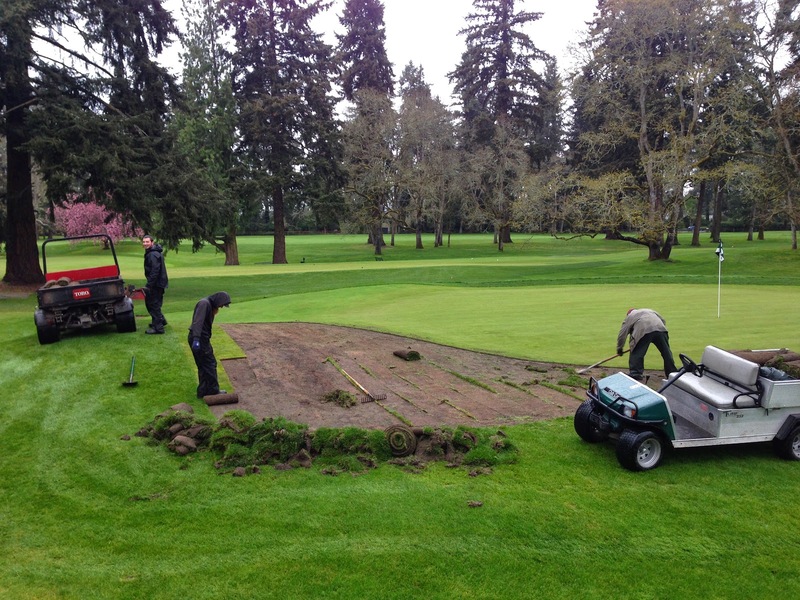 The new bunkers continue to be the topic of many discussions around the Club. Everyone just loves the way they look but when you ask if they like the way they play, the positive comments are not anywhere near as unanimous. We have been looking hard at various types of rakes and various types of raking styles with the objective to make the condition of the sand firmer. What we're doing now might surprise you as our general philosophy has become "do as little as possible". 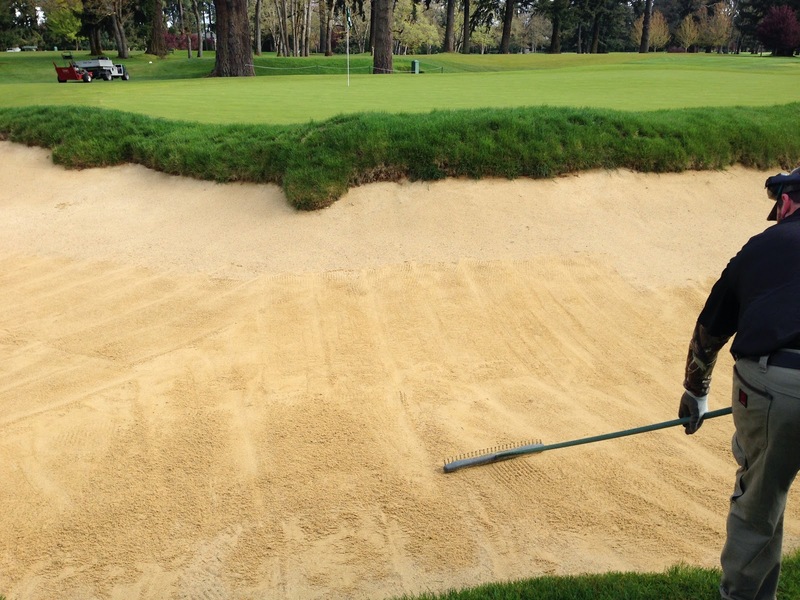 We have found that the best way to achieve consistent and firm sand conditions is to just stop raking them all together since it's the raking of them that tills the sand and makes them play soft. So now we are adopting a new method we like to call "SMEARING". 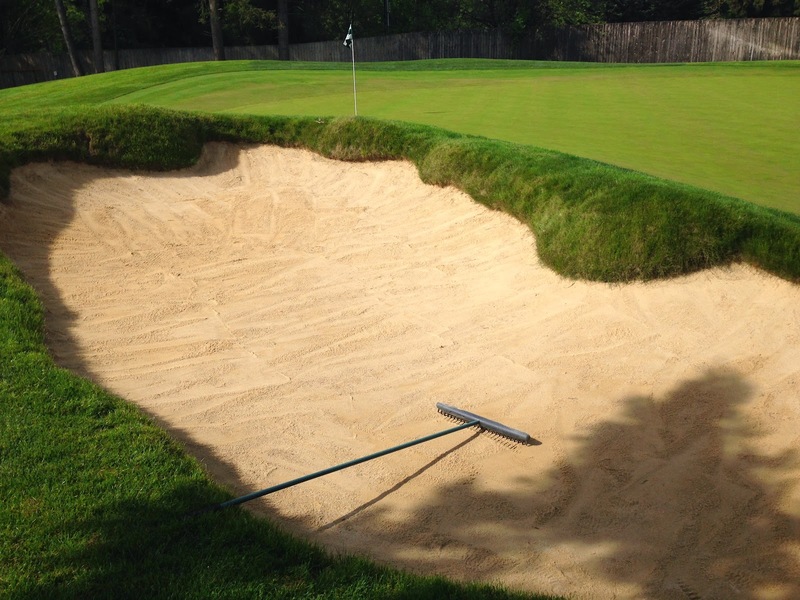 In the picture above you see that the bunker rake is actually flipped upside down and the sand is smeared to look smooth, almost like spreading butter on toast. Also look at this picture and you see that the steep face is left as it was found since it hasn't been disturbed at all. Now that we've been doing this a while, the bunkers have gotten smoother each day and firmer since there is very little sand disturbed with this process. I was concerned about how this technique would make the bunkers look, but it actually has worked out fine and people have even complemented me on the look. Bottom line is play-ability is the most important thing and this new method is working well in that regard. Balls are not plugging, or getting hung up on faces. Here's a little video showing the smearing method in action. 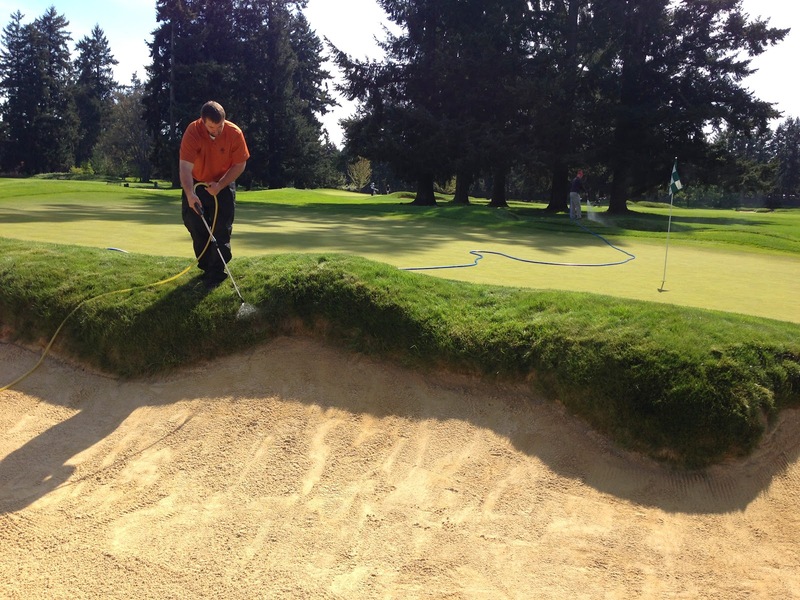 By the way, you too can smear the bunkers when you rake your way out. It will leave it more playable for the next person. Also on the subject of bunkers, check out in the picture below as you can see Tim is spraying something on the fescue eyebrows. This is our spring priming of the soil with wetting agents. We do this to all the fine turf areas of the course but we have never done it on bunkers since of course the bunkers are brand new. 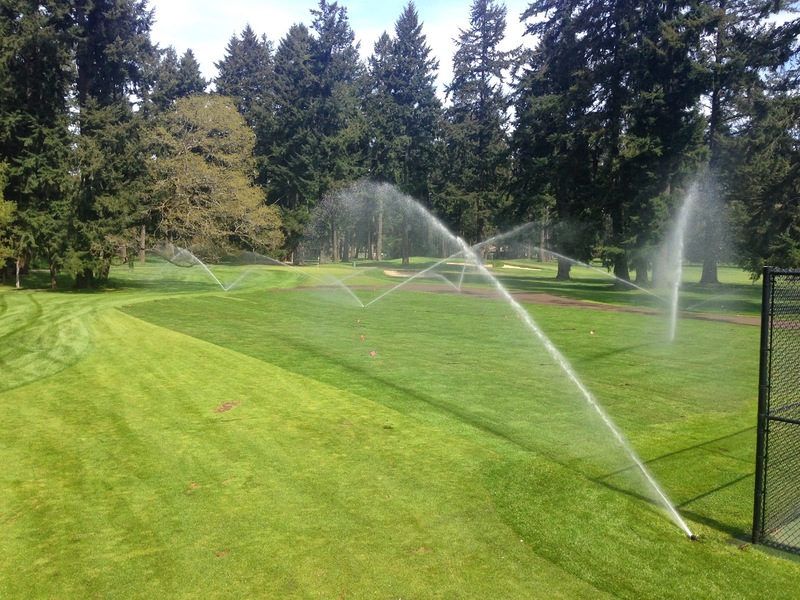 Wetting agents are really fancy compounds that once in the soil, they allow water to infiltrate "hard to wet" areas and even allow soil to hold water for extended periods. We use products like this on all of our fine turf areas to help manage moisture levels, but we are using high doses of a product that really holds water on our bunker eyebrows with the hope that we don't loose any fescue to drought stress this summer. I know summer is a few months off but getting this stuff in the soil early is the key to success. I just noticed that also in this picture you can see Richard in the background "watering in" the product on the other bunker, and check out the sand in foreground............it's just been smeared. Since we moved 90% of the sod off of the practice hole fairway to build the new 9th tee, we thought we may as well use the last 10% of it for some other areas. 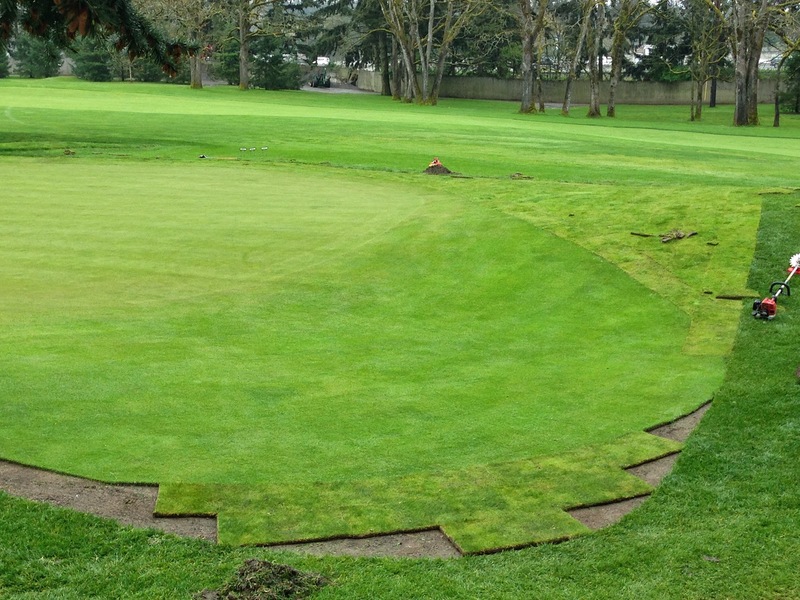 The picture below is of 6 green surround where we installed our first "run off" area several years ago. 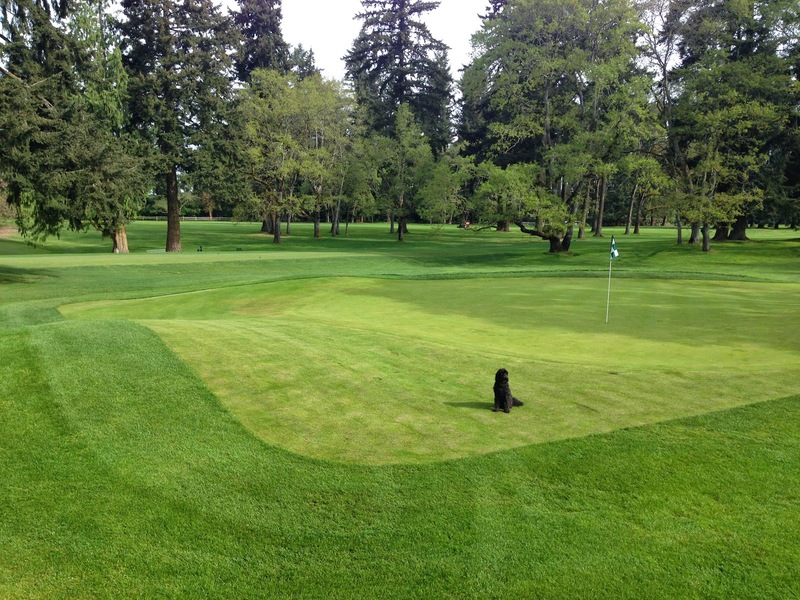 When we started adding these features to the course, we started small. Quickly we realized that the bigger the better on these areas so now we want to go back and increase the size of the ones we installed early on. 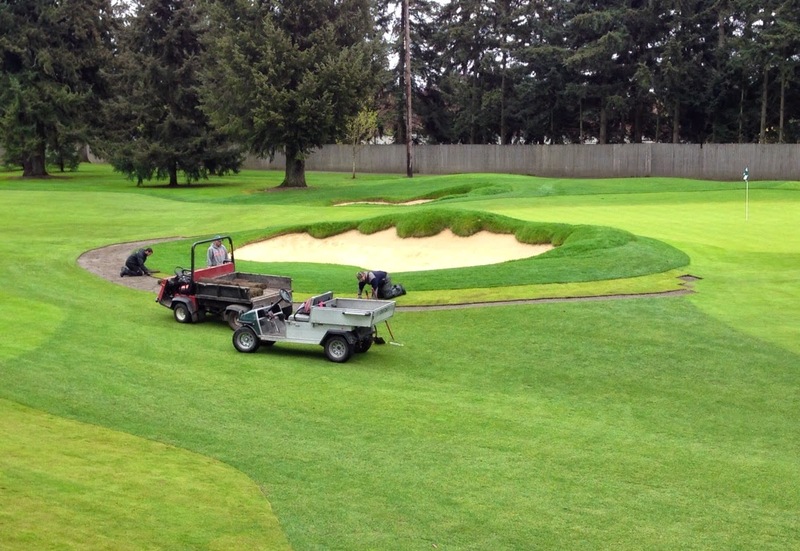 The picture below shows how this area on the back of 6 looks today now that the sod has "healed in a bit". Boo thinks it turned out great and so do I. At the same time, some sodding is going on near the 5th green. Here we are just switching out some poa sod from the practice hole fairway since this area has now become fairway turf. The sod we are taking from here is pure ryegrass which looks very different from our poa fairways. None of this ryegrass sod is being wasted though as we are using it to sod some of the areas on the course that are roughs. The ryegrass is a suitable grass for roughs. So here is where all this poa sod is coming from. Below you see the practice hole fairway which we seeded back in 2008 to pure ryegrass. Since then it has converted to a decent sward of poa and it definitely was the perfect source of good sod for the 9th tee project. Thursday we sodded a good portion of this fairway in order to get it back into good playing condition right away. A full truck load is 13,000 square feet and in order to get the best price on the sod, we like to buy it in full truck loads since shipping is a good portion of the total cost. We were ready to go first thing Thursday morning but unfortunately the sod truck got held up at the scales in Cle Elum and we didn't actually get the product here until about 11:30. I assumed we would be staying late to get the stuff laid out but my staff really responded to the challenge and they laid all of it before quitting time at 2. Your golf course staff is SIMPLY AMAZING !!!. Did I mention it was a record breaking 85 degrees that day? Here's how it looked at day end. There is still some areas that need to be sodded but we will wait until we can again order a full truck load. 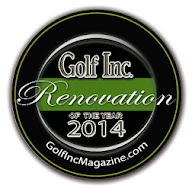 We are close to finalizing the plan for the practice hole bunker renovation. 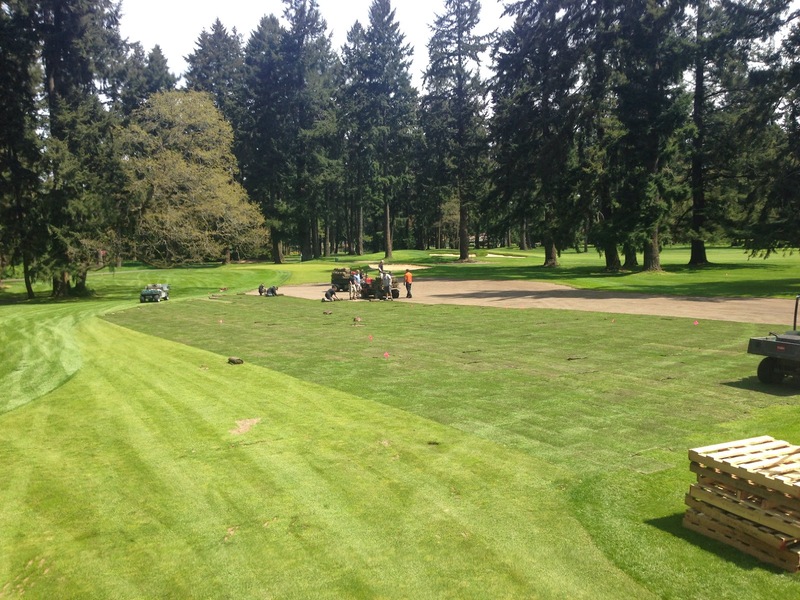 When that project gets going we will have the opportunity to order some more sod and then finish grassing the fairway. 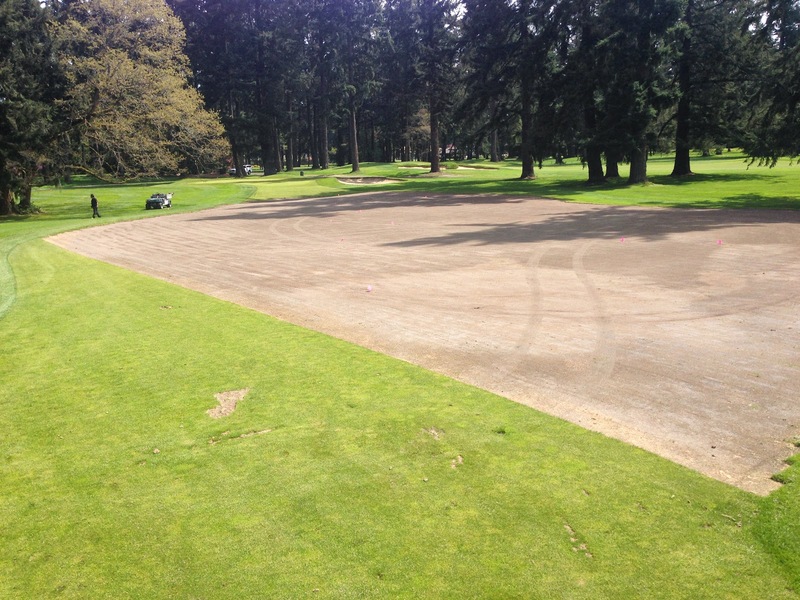 Lastly, you will notice a change in the sand and seed mixture on the golf course. In the past we have always used colonial bentgrass seed as that grass blends in well with our fine texture poa annua fairways. You can see in the picture below that the bentgrass seed is very tiny which is why you never really could see it in the sand mixture. Now look below at a picture of the new mixture and you can clearly see seed. The new seed is chewings fescue. Why the switch? Simple......I'm not very happy with divot recovery using the bentgrass so I needed to try something new. Fescue germinates quicker than bentgrass and is generally more adapted to our climate so it will hopefully persist in the divots. In fact, fescue is one of our native grasses and you can find it just about anywhere in our area. Click here for a more detailed look at our native fescue. Also, chewings fescue is fine textured like our poa so it should blend in well. 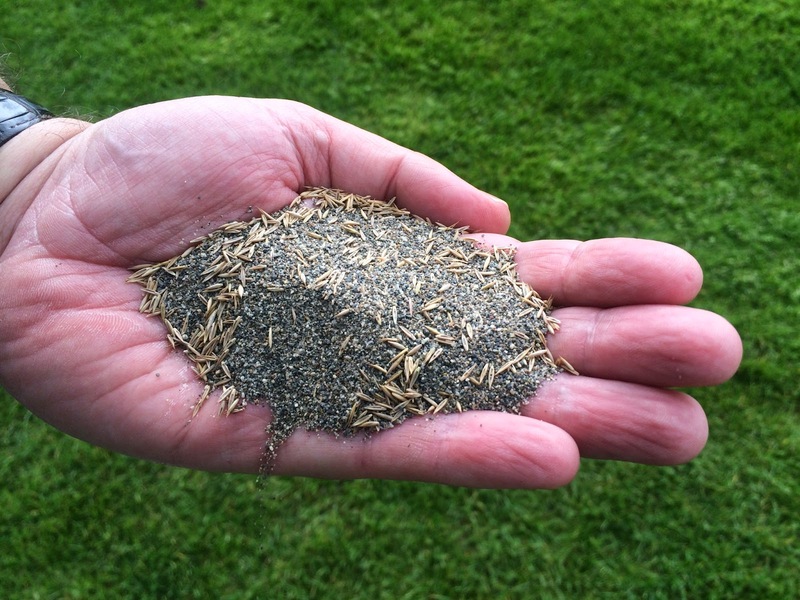 In addition, unlike ryegrass or bentgrass, fescue is suitable as both rough and fairway so this means you can use the mixture anywhere on the golf course so have fun filling those divots and fill as many as you see.